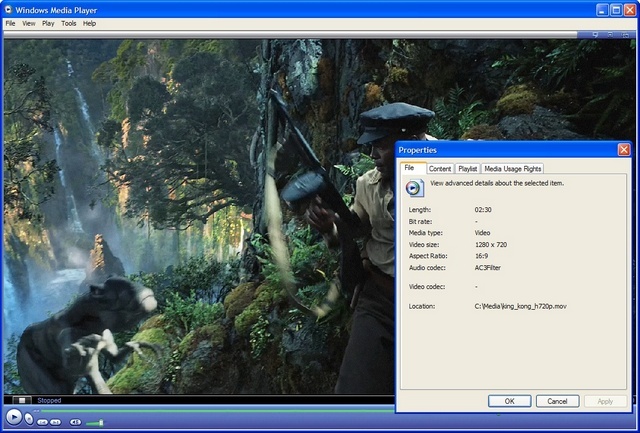 River Past QuickTime DirectShow Filter for WMP let you play QuickTime, MPEG-4(MP4, M4V), DV and 3GP video, MPEG-4(M4A) and AMR audio, animated GIF and FLC animations in Windows Media Player. QuickTime DirectShow Filter for WMP uses the native QuickTime codecs for speed and compatbility. It is often faster and smoother than the standard QT Player. No spyware or adware. Compatible with XP and Vista, including 64-bit Windows. If it can be played in QuickTime Player, it can be played in Windows Media Player, with QuickTime DS Filter installed. However, it only uses the codecs from QuickTime, without the additional weight of the full QT. By using the standard, multi-threaded DirectShow architecture, it is fast and feels at home in Windows Media Player. Indeed, it is often much faster and smoother than the standard QT Player. The best part is, it is completely free. Simply download and install. Once installed, you can use your Windows Media Player for all file types. It's that simple. River Past QuickTime DirectShow Filter for WMP is compatible with 32-bit and 64-bit Windows XP and Vista. Please have QuickTime installed. We use the codecs from QuickTime. Please have Windows Media Player 9.0 or later. Qweas is providing links to QuickTime DirectShow Filter for WMP 1.0.15 as a courtesy, and makes no representations regarding QuickTime DirectShow Filter for WMP or any other applications or any information related thereto. Any questions, complaints or claims regarding this application QuickTime DirectShow Filter for WMP 1.0.15 must be directed to the appropriate software vendor. You may click the publisher link of QuickTime DirectShow Filter for WMP on the top of this page to get more details about the vendor.